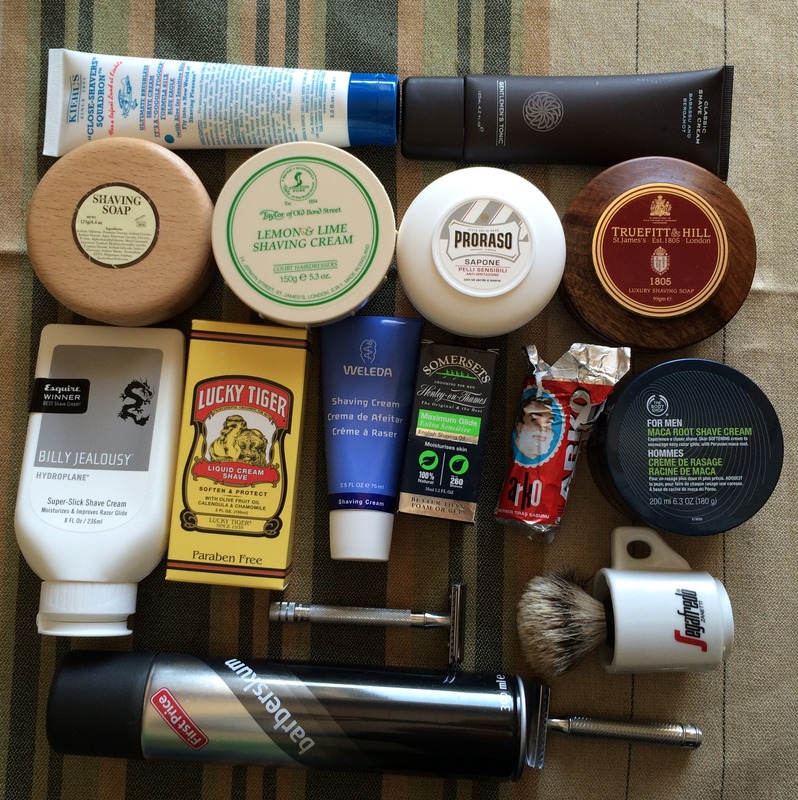 The Great Shaving Cream Investigation - Summary - Well Dressed Dad - It is a proper menswear blog. Like, with original words and opinions and suchlike. Ok, now that we are all on the same page, what has this trial shown? To be blunt we can quickly conclude that there are good solutions for shaving lubrication, and there are incredibly poor ones. While all claim to be something along the lines of “the best”, several of those tested were clearly making quite outrageous claims. Some had obviously spent their development budget on smell or packaging, which would appear to be a poor strategy in the long run. Have my criteria changed under way? Partly, yes. I have learnt to appreciate the ease and speed of using a good cream from a tube, and at the same time very much enjoyed the more time-consuming process of using a badger brush and traditional soap. Depends a bit on what you are after, whether it’s at the crack of dawn on a bleak Tuesday in November or whether it’s a fine Saturday morning where you have time to enjoy an espresso in the bathroom while enjoying a shower and a shave. Notice the red on the Billy Jealousy? That’s a red flag, due to naughty ingredients, so while it may offer a top-class lubrication experience, you are probably wise to avoid for other reasons. Consistency is probably not a major selling point in itself, more an indicator of how pleasant the cream is to work with. 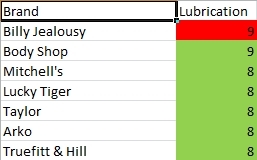 It may or may not be a coincidence, but the ranking list for consistency is almost identical to that for lubrication, so I’ll not reproduce the table again. For that great smell, it’s either Arko the soap or Taylor the cream. 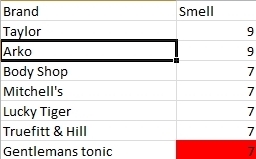 Among the also-rans the Truefitt & Hill and Mitchell’s Wool Soap come to mind as being memorably good. Of course, this is not exact science and one man’s evocative scent may be another man’s claustrophobic smell of doom. 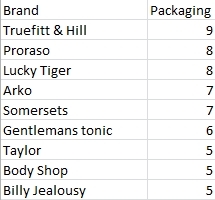 So, the effort made by Truefitt & Hill in their packaging does pay off. Even the less expensive efforts of the next places show that spending a bit of money on some decent graphic design makes a big difference. So there you have it. The results are in, they have been tabulated and considered. You may now make your choice, and you are allowed two. One for the daily drudge and one for the weekend pleasure. And just to show how impartial I am, none of the products reviewed were sponsored by the producers. I was gifted the Truefitt & Hill by the owner of Barbershop.no, otherwise I purchased all as a regular customer with my own hard-earned cash. In closing though, I did promise I would test the absolutely cheapest option available to me, as in the cheapest off-brand, own-brand supermarket shaving lube in my local supermarket. I did not look forward to this, but consider the lengths I go to in my quest to provide illuminating blog-style information for you, dear reader. I found a 300ml aerosol can of “Shaving foam”. 300ml is a pretty decent sized can, and it cost less than a pound. That is a lot of foam for the money. I’ll not beat around the bush or even try to review it in full. After giving it a good shake to ensure it had at least a fair chance of presenting itself well, it was clear from the first squirt that this would not go too well. 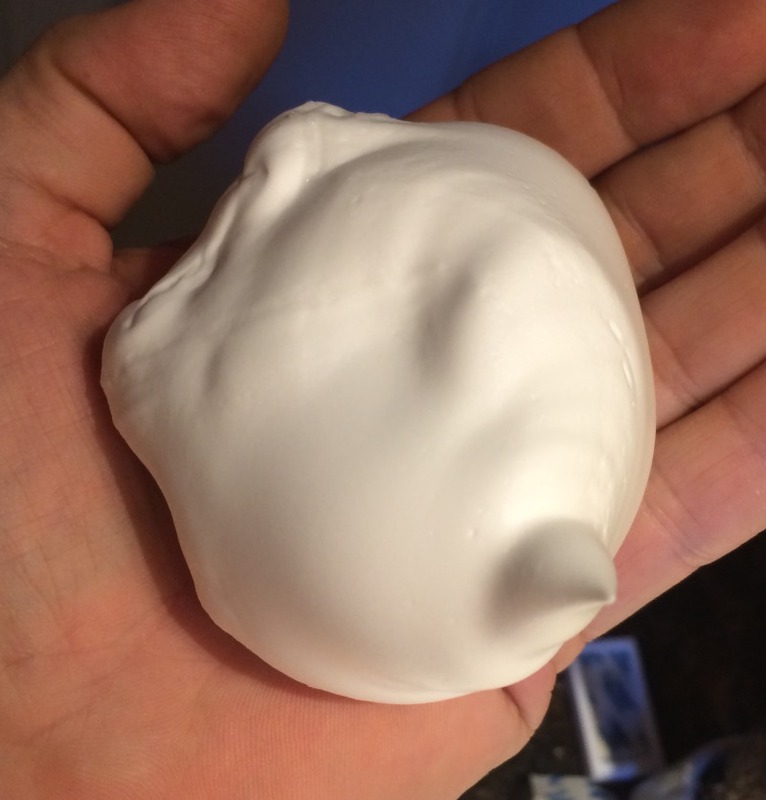 A brief press and I had a handful of quite dense foam. Applying it to my face gave me the feeling of it lying as a layer over the stubbles, where other creams let you apply them on the skin. When shaving there was almost no feeling of the foam lubricating, it was more a case of the razor removing foam, and randomly stubble, but mainly after the foam had been removed. This was a really poor experience. 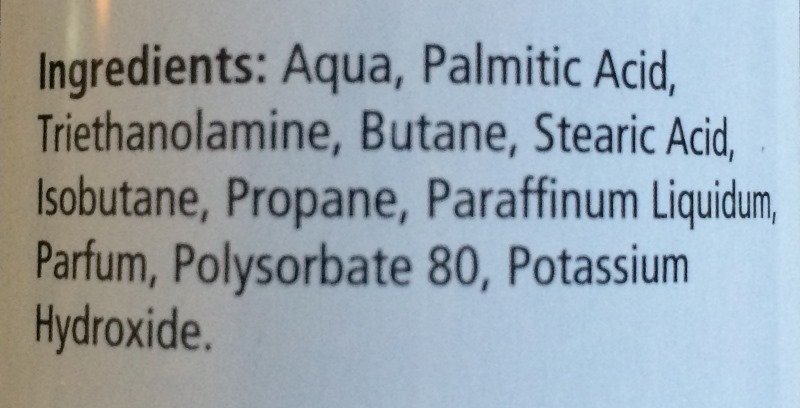 To give them a tiny bit of credit though, the contents appear to be mainly water and stuff related to the aerosol gas. For the price though, can you really expect it to be any good? I can’t imagine the economics of producing this, as it is proudly made in the UK, sold in Norway, and at under a pound a container. 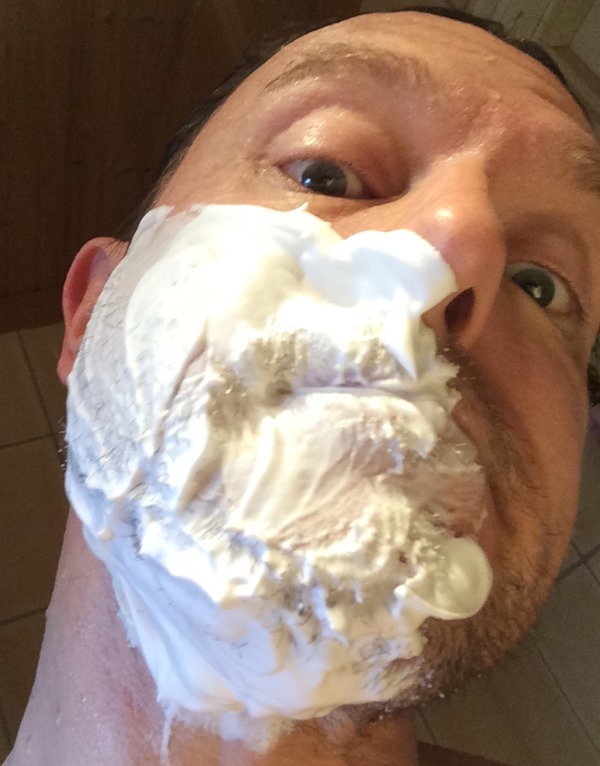 To finally conclude, do yourself a favour and get a good shaving cream. Smooth cheeks and jowl and a burn-free face is no more than your should expect at the start of a day. Are we agreed on that? So you’d like to maim yourself with your new safety razor?